I just read this on ABC news Tampa's website...now you Younger folks take this a bit seriously ok.........A new report by the Union of Concerned Scientists says over the next 30 years 64,000 homes in Florida will be at risk for chronic flooding — worse than any other state. They say the Tampa Bay area stands out as one of the most highly exposed cities.................my guess this is from global warming and sea level rise..its a good idea to pay attention to your homes'' feet above sea level''..especially if..your thinking of Buying a new home in the future. well i just checked my homes elevation and according to my city my home is 28 feet above sea level, and im wondering now would this supposed sea level rise affect MY home?..i had thought i was 50 feet above..guess i was wrong...........it might be to your best advantage now..to check and see what your homes elevation is? huh..i just checked my counties flood zone map and none of the flooding even comes close to me........maybe they will make one some day that shows flood zones for sea level rise here. That's a classic signature there St Pete. I love seeing outflow and/or seabreeze boundaries like that and wait in anticipation for the storms to erupt near/along them. Read the end of the last blog - how much do I water my lawn? As little as possible - I've probably only watered half a dozen times over the past year. Overwatering subjects the lawn to disease along with having a shallow, unhealthy root system among other things. The lawn can't build up a tolerance to a prolonged dry spell if watered a few times a week. I was oblivious to the weather today. The forecast from yesterday called for ZERO chance of rain. Skies darkened so I checked the radar. Heavy cells to my immediate north and west with flood advisories. They are collapsing now. I won't get anything but it was a pleasant surprise with the soothing rumbles of thunder, cloud cover/cooler temps, and the smell of rain in the air. StAugustineFL wrote: That's a classic signature there St Pete. I love seeing outflow and/or seabreeze boundaries like that and wait in anticipation for the storms to erupt near/along them. I don’t have St. Augustine grass so I only water once a week, grass is fine. My neighbor does and waters every... single... day... The mosquitoes are terrible. In the “winter” I grow rye, have to mow a lot but it doesn’t require a lot of watering. frequent lightning, and brief gusty winds. Florida today. The main hazard with any activity is lightning. Florida waters with any showers or thunderstorms that form. South Florida this weekend through the beginning of next week. Good Wednesday Morning folks! 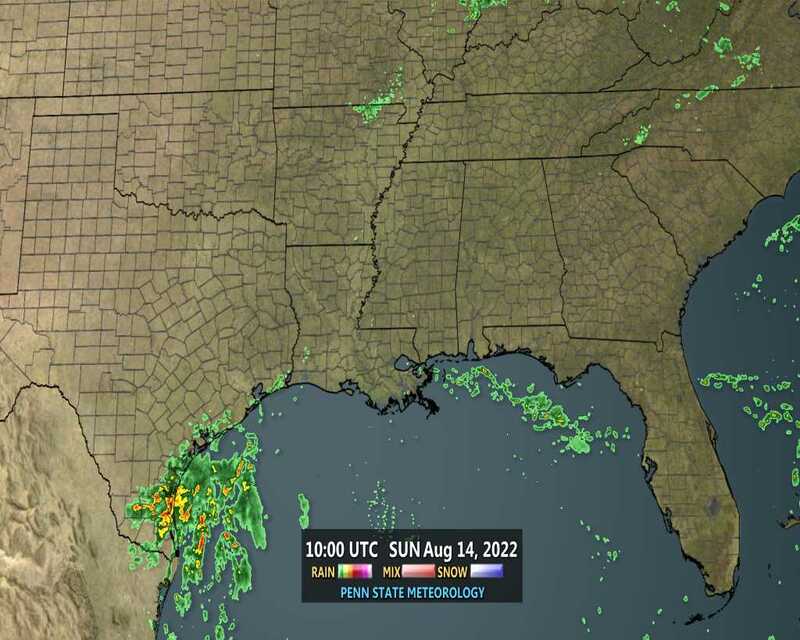 well if you liked the weather yesterday, it seems and we have another one just like it,and folks on the nature coast might get some more rain....still dont see anything tropical bothering us on the over night model runs..thats good huh...well have a great day folks!! What a light show this AM. Strong T-storms have been training down the coast since around 4:30 this AM and the lighting/thunder has been just about non-stop. Heavy rain was just to the west of me at the house, but picked up over 3" so far at work in Cedar Key. This is much needed rainfall in Cedar Key as it has been very dry here the entire month of June. I am happy the rainfall so far has eluded me at the house this AM as I got 1.10" yesterday, bringing my monthly total to 4.25". Hope others can cash in later today. waterdipper wrote: What a light show this AM. Strong T-storms have been training down the coast since around 4:30 this AM and the lighting/thunder has been just about non-stop. Heavy rain was just to the west of me at the house, but picked up over 3" so far at work in Cedar Key. This is much needed rainfall in Cedar Key as it has been very dry here the entire month of June. Waterdipper I could see the light show from my house this am. I have not received any rain since last Friday. All's good, I have 2.97 in the bucket for the month so far. Thinking the rain gets turned on today and tomorrow for my area. Lets see!! good morning John, good luck on the rain today!! Up to two inches of rain has already fallen. Saint Petersburg, Downtown Saint Petersburg, St. Petersburg, St. Nature Preserve, Crescent Lake, Pinellas Point and Snell Isle. Additional rainfall of 1 to 2 inches will be possible over the area. develop further to the south during the afternoon. will approach 100 over the interior. Hey WD.... glad you racked in the rain this morning! It did train down the coast UNTIL it got to me...lol. I listened to thunder a long time this morning, but nada in the rain department. Good Thursday Morning folks! !..it looks like a slightly better chance for some rain later today, I can surely use some..congrats again to those who DID get the rain yesterday! !...well blogs Coffee-Tea-Cocoa will be ready when you get here...grab a cup before heading out to work etc...have a great day everyone! areas. The main hazards are lightning and strong, gusty wind. across South Florida today, mainly in the afternoon and evening hours. 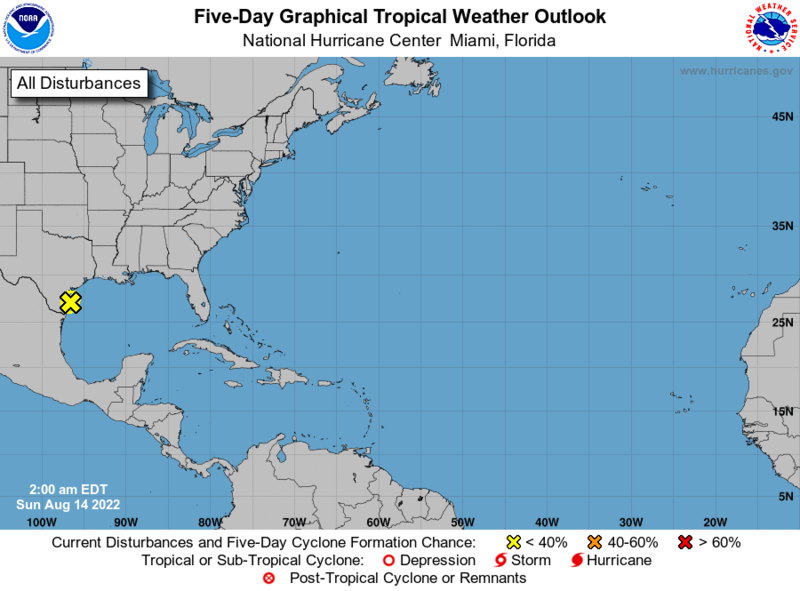 South Florida waters with any showers or thunderstorms that form. Good mornng all. Extremely humid here today. My windows were all fogged up when I got up this AM and when I walked outside to go to work it felt like walking into a sauna. Storms have really started firing in the Gulf and the rumble, rumble has already begun. Rain looks like it is staying over the water for now, but hopefully will build inland. My secretary who lives a mile away from me hasn't had any significant rainfall in 10 days so I hope she gets some today. Anyway, I don't see any changes in the pattern coming up so rainfall chances should stay high for all for the foreseeable future. waterdipper wrote: Good mornng all. Extremely humid here today. My windows were all fogged up when I got up this AM and when I walked outside to go to work it felt like walking into a sauna. Storms have really started firing in the Gulf and the rumble, rumble has already begun. Rain looks like it is staying over the water for now, but hopefully will build inland. My secretary who lives a mile away from me hasn't had any significant rainfall in 10 days so I hope she gets some today. Anyway, I don't see any changes in the pattern coming up so rainfall chances should stay high for all for the foreseeable future. southwest Alabama, northwest Florida and southeast Mississippi. northwest Florida panhandle today and tonight. the strongest storms that develop. northwest Florida panhandle beaches through the weekend. It has been dark and rumbly here at work all morning and finally the skies have opened up and it is absolutely pouring. Looking at the radar it is missing the house inland, but this line is traning from Cedar Key down the coast to Citrus County and dumping some good amounts of rain. Radar estimate from Crystal River is already over 2". you be extra careful up there WD..stay safe ok.
severe storm warnings over in the Orlando area etc..stay alert and safe folks. Osteen, or near Deltona, moving east southeast at 10 mph. Orlando, Deltona, Sanford, Altamonte Springs and Oviedo. through 230 PM EDT with these showers and thunderstorms. Heat index values are reaching above 100 degrees this afternoon. * Until 300 PM EDT. Port Saint John, Turtle Mound, Bethune Beach, Lagrange and Mims. well not a drop by me here so far..good luck to those who did...and some of those storms were pretty strong, hope no one got any damage etc. Kissimmee. Movement was southeast at 15 mph. Palm Bay, Melbourne, Cocoa Beach, Satellite Beach and Malabar. * Until 445 PM EDT. Damn WD, you need to share!!! We got a very brief rain today. And dang it is HOT . Not unusual for June, but we were spoiled with so much rain and clouds the past month. I don't say this often but WOW, what a storm today. I'm not one to hype a thunderstorm but the one today had some umph to it. Not sure if there was a weak EF0 tornado or a wet microburst but I had some of the roofing materials atop my roof blow off. Saw a few trees snapped in the neighborhood along with downed power poles towards the entrance of my sub. I got knocked off the grid for 7 hours. Deluge for an hour with non-stop lightning/thunder and that period of wicked winds - whatever the source was. Rain gauge has 3.2"
StAugustineFL wrote: I don't say this often but WOW, what a storm today. I'm not one to hype a thunderstorm but the one today had some umph to it. Not sure if there was a weak EF0 tornado or a wet microburst but I had some of the roofing materials atop my roof blow off. Saw a few trees snapped in the neighborhood along with downed power poles towards the entrance of my sub. I got knocked off the grid for 7 hours. Deluge for an hour with non-stop lightning/thunder and that period of wicked winds - whatever the source was. Rain gauge has 3.2"
wow im glad Your ok Aug..that must have been on Bad storm by you whew.